Great time. Fishing and boat crew look after us well. – Terry Wright. 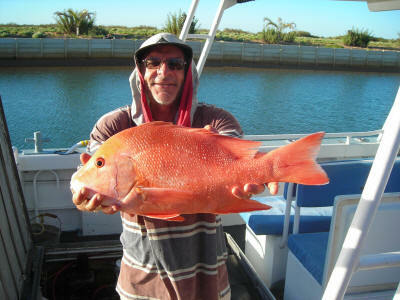 What can I say to describe this weeks fishing in Carnarvon “Bloody Great” – Keith Preen. 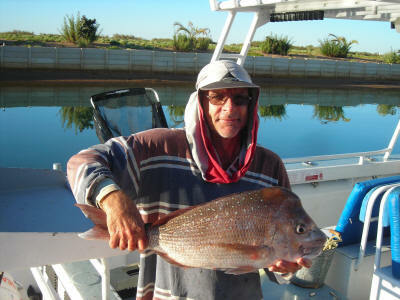 Great fishing, great skipper and great spots – Jeff Murray. Great, great, better, perfect, more great – Garry Williams. For both the first time Carnarvon anglers Alan and Adam, to the annual veterans of Rob, John, Rowan, Phil and Brian, a charter week to remember. Challenged by mixed weather, lizard fish, sharks and lost gear the overall experience has been first class with Mark’s fantastic meals, Chris’s daytime lunch’s and beautiful slices, finally Brett’s perseverance and precision in finding many varieties of fish, (lessons to the rookies) and constant good humour despite the challenges. The Indian Chief Charter team has delivered a week of lifelong memories. – Rob Kay, Phil Rowe, Brian Sierakowski, John Linquist, Rowan Matthews, Alan Sierakowski and Adam Sierakowski. Thoroughly enjoyed the week, fishing excellent and meals out of this world, dips a specialty. Fishing is not a case of life and death - its much more important than that – a quote by the famous Sav. Hope to see you again next year. Herewith our booking for next year - Ron Mack, Alan Wall, Geoff Crane, Colin Taylor, Bevan Lang, Ian Harkin, Sav, Laughton and Dave Hughes. Fantastic hosts, Many thanks to Brett, Chris and team, Mick and Mark. A slow start but what a finish, everything happening, great week, already looking towards 2016. – Eddy Doyle, Carlo Doyle, Darryl Boardman, Terry Boardman, Kelvin Fisher, Doug Mc Dougall, Tom Oates and Brody Armstrong. We came, we took, we eat all you got. Cheers Morley Bowls. Thanks to you all for a wonderful week, we all had a great time and even caught some fish!!! We’ll spread the word at the Morley/Noranda Rec Club and am sure you will get some returning customers next year! We simply had an awesome and memorable week. We all appreciate the efforts you all go to, to make this happen. Brett and Chris, thanks for a wonderful week. Brett and Chris, thanks for another fantastic week of fishing and eating. You both run a very professional operation with the clients interests always in mind. Another fantastic week – the others have said it all but I want to thank Brett, Chris and the two Marks for making our visit so memorable. What an exceptional week! Excellent fishing, excellent food, excellent weather and of course excellent fellowship. Brett and Chris have taken ‘Indian Chief Charters’ to a higher level and their ‘extra’ touches have made a great difference. Thank you for your attention to detail and for giving us a memorable week. Many thanks also to Mark and Mark the Chef. Brett and Chris, what a transformation of Indian Chief Charters. Your creation of UTOPIA has been memorable. After 6 years of wonderful fishing and hospitality you have created an environment of tranquillity and beauty. The fishing this week has been the best ever and the variety beyond expectation. The weather allowed us to travel North to Quobba and smash the fish. Your friendliness and want to please make the stay at ‘Pelican Point’ a necessary adventure every year. Thank you for all these memorable times. Great way to spend a week, best fishing in the west. Good fishing, great biscuits, thanks Chris and Brett, makes you want to leave home. To the Indian Chief Charter Crew. Thank you for an amazing week! The fishing has been AMAZING! The best time of my life was had every single day. Thank you so much to Brett, Callum and Bruce for taking us to awesome fishing spots and for taking care of us. Vito says Brett has an awesome moustache and he wants one! Thank you to Suzi for feeding our crew and keeping us entertained! Can’t wait to come back next year to “Live the Dream” again. To the Indian Chief Charter Crew!! Thank you for this Amazing Week!! Here is the paradise for all fishermen. Thank you Brett, Bruce, Callum for sharing your splendid Orange fish!! It was an awesome week that I will never forget. Thank you Suzi for your really great meals and taking care of us. We really enjoyed!! All the best for all the Indian Chief Charter Team!! Indian Chief Charters is an experience that we chose to try a second time after a great first time last year – Great to say it gets better and better. Brett is the most patient and obliging Skipper we have ever met. His high standards follow through to his deckies. As people with some experience in tourism we commend the team on their professionalism and customer service – beyond the call of duty. Sorry for the tangles, over runs, lost gear Brett, how you keep smiling is a mystery. The relaxed accommodation arrangements really enhance the overall experience. Lastly, but not leastly – the way to 8 men’s hearts are through their stomachs and Suzie excelled. Not only was the food to gourmet standards, her ‘mother hen’ personality and ‘can do’ attitude was really awesome. Thanks from all of us. We’ll be back. Awesome fishing – best weather in three years – at least 5 days fishing straight, Carnarvon is the best kept secret and we only hope it stays that way. Thanks to all the crew and staff for a great week and look forward to many more in the future. Cheers from us from Down the South. Great Location, Fishing, Weather, People, Food. We will return. Fantastic fishing trip as usual Brett and crew Callum did a great job and we pulled in some great fish in fairly rough conditions. The meals were great – thanks to Suzie (for the second year) and to Christie for the excellent food and friendly company. We really enjoy the location and the ability for all of us as mates to get together in perfect surrounds for us fishos. Again, thanks to all for a great week. A great week of fishing when you only loose your stomach once. Thanks Brett. One of our most successful trips helped by fantastic weather for the first three days. 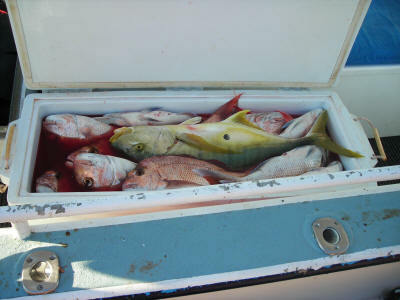 Full quota of fish caught each day. Crew blended well and good humoured fellowship enjoyed by all. Brett (the sly fox) found fish and if he hit a bad spot we moved quickly. Callum, the best deckie we have had since Bruce. Any problems ironed out by PR lady extraordinaire Suzi. Thanks to Suzi and Christie for keeping us very well fed. Fantastic time had by all. Fantastic trip in all respects. Great fishing, great food and good company. Staff friendly and courteous and loved by all. Many more trips to come. P.S The ice cream with wafers and chocolate should be every night! Poached eggs the best in the universe! It’s only a 9 hour drive from Perth and you arrive at a relaxed location. The charter was fantastic it’s the best charter I ever been on. There was a great range of species . Had the most helpful and fun crew ever. I was fishing next to a 73 year old and Im 21 it was so much fun. Ive never experienced such a relaxing holiday before. The tranquillity of the surrounds made it very special. Not having to prepare food, cook or clean was even better… I could just focus on fishing and enjoying. Fishing is my passion – Im definitely coming back to Indian Chief Charters – it’s the best I’ve been on – great bunch of crew and skipper knows where to find quality and quantiy of good range fish! ***kin awsom – top blokes – top fish Im definitely coming back tomorrow. Highlight for me was catchiong a huge Dhufish where they are not supposed to be. The food was spot on and accommodation was lovely. Great ocean environment seeing nature at its best. Caught an excellent variety of top table fish.” Best charter Ive ever been on and I’ve been on chargers all around Australia. The on board support at Indian Charters is excellent! I’m writing to say many things. I have booked a group of 8 with Peter Anticich for the same week in July next year and will forward a 10% deposit in a couple of weeks. Now, why? Where will I start. Peter, Bryan, Brett, Jack and Bruce were just the best bunch of guys. Nothing was too difficult for them. They were so accommodating. We couldn’t believe the quality of the food that Bryan kept coming from such difficult conditions. But I need to say we didn’t go for the food, but without a shadow of a doubt it topped off what was a terrific 4 days of fishing (we got blown-out on Monday – that happens so we enjoyed the peace and quiet of the beaches and environs of our base). The boat crew made the trip for us. Spending 10 hours with these guys was a pleasure. Brett was an outstanding skipper. I mentioned to you that I’m a member of game fishing club and I have had interactions with many skippers. Brett’s manner and skills clearly indicate that he’s from the top shelf; don’t lose him. Jack never stopped working. He kept a very clean deck and nothing phased him. He ensured everyone was looked after in a timely, cheerful and skilful manner – what a great guy! It is a pity he won’t be the decky next year. Now the only thing you can say about Bruce is “Mister Cool”. Great support for both Brett and Jack and such a nice guy. When Brett and Bruce got on to their tag team jokes after one of our fantastic meals you could tell they have a special bond. Peter was the MC of the operation looking after our bits and bobs as well as driving us to Carnarvon and most of the way home without any sense of things being too much for him. There were 8 very happy, gloating and well-fed fishers on the journey home on Saturday, with more than our quota of fish. The 4 in my group were involved in a small competition (competing for the daily prize of the Caudal Peduncle Cup culminating in the overall prize being the Pelagic Obsession Cup – named after the boat of course) so we kept a reasonably accurate tally of our catch. In 4 days fishing we caught 130 fish, made up of 32 different species totally over 360kg. The other 4 would have had similar numbers. 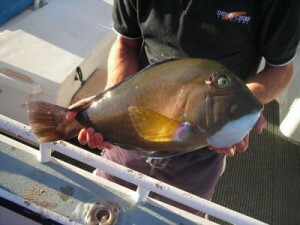 A portion of the catch was returned – either too small, too big or non-eaters. Fishing doesn’t get much better than that! Attached are some photos for your interest – Jack download all/some/most of my photos on to his laptop. On behalf of the 10 guys that went on the fishing trip in early May 2008, I would like to thank you all for a fantastic trip that you all help to make it happen. Staying at the Carnarvon Beach Resort is an ideal location at Pelican Point, which is about 5 kls out of the town but on the other side of the Fascine, close to the beach and the channel to get to the islands which are quite a distance offshore but after a good few hours fishing, the trip home is about a four tinnie trip which is also enjoyable, weather permitting. The boat Obsession 1 was great to fish off and very stable in all condition with some fantastic fish caught such as a 6.5 kilo Coral Trout, plenty of big Pinkies, Spanish Mackerel, Rankin Cod and plenty of other species. Our skipper Brett did a great job along with our decky Jack, we all caught our bag limit and we were all happy to help with the filleting of the days catch, after which we could just relax with a cold beer or two and watch the sunset. Brian was our cook or I should say our chef, the food was absolutely fantastic and was much anticipated, every night he would come up with dinner while sitting under the stars. Next morning Brian was up early getting us all breakfast and packing a nice lunch to enjoy on the boat that day. We have all been on many fishing trips but this was the best as all we need was ourselves, not having to worry about towing a boat up north, buying and cooking all the food, cleaning up the mess and arguing about who’s turn it was to cook or clean up was just great. I would highly recommend this trip to any keen fisherman or if you are a first timer all the better as everything is provided and the rods and reels are all in good nick, and I cannot rave enough about the food, which there was plenty of. Once again our thanks to you guys for making it a very memorable trip and we all agreed to come back next year. Kim, Peter, Glen, Todd, Mick, Dave, Nels, Russ, Phil and Rob.